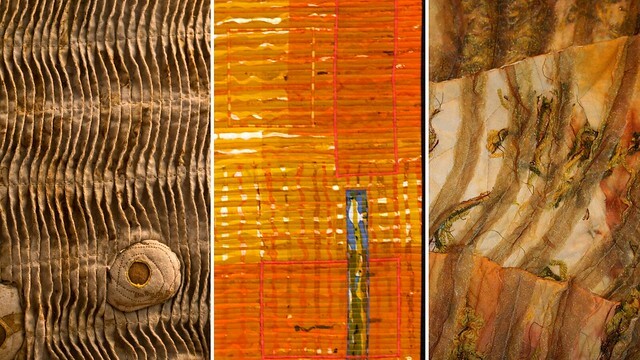 Fabric manipulations by Sidney Nettles Coates (left), Christine Zoller (center), and Lara Parks (right). Description: Experiment with fabric manipulation and surface embellishment techniques! Manipulate by twisting, gathering, pleating, layering, cutting, and weaving your fabric. Embellish with stitching, fusing, layering, and beading. Then, combine fabric manipulation and embroidery to create successful compositions with rich surfaces that beg to be touched. You'll learn through demonstrations, slides, discussion, and sampling, and you'll complete with a binder of technique studies for future reference and at least one completed work. Best of all, you'll leave understanding how you can manipulate fabric to achieve the tactile and visual effects you want. Christine Zoller received her MFA from the University of GA and has been an Associate Professor and the Coordinator for the Textiles Program at East Carolina University for over 22 years. She'll retire this year as Faculty Emeritus, and will have more time to pursue her art -especially the creation of surface design pieces utilizing hand- and digitally-printed fabric with embroidered and beaded surface embellishments. Christine also has a business creating and selling silk accessories and beaded jewelry. Her work has been exhibited internationally and she has taught workshops across the country, including at Arrowmont and Penland. Experience Level: Basic hand- and machine-sewing skills. Fabric - small amounts (fat quarters and 1/2-yd pieces) of as many different types as possible. Include at least two transparent/see-thru fabrics. Fusible webbing - 2 yards. Wonder Under is preferred. ​Additional Supply Fee: None, but Christine will have many supplies available for purchase including interfacing and fusible webbing. Student Scholarships: There is one student scholarship available for this workshop. Scholarship applications are due two weeks in advance of the workshop. Only deserving requests will be awarded; application does not ensure acceptance. Please note, there is a 9-hr volunteer commitment in exchange for the scholarship (3 hrs. per day of the workshop). Registration and Payment: Scroll down for online registration and payment. If you prefer to register and pay for the workshop by mail, click here to print a registration form. If you have trouble registering or paying (Safari users!) or if you are concerned that this website does not have an https address, please use the following direct link for registration and payment: https://sefaa.secure.force.com/Programs/CnP_PaaS_EVT__ExternalRegistrationPage?event_id=a0u0V00000mf86gQAA. Sorry, this workshop is over. Please visit SEFAA's website for upcoming classes, workshops, exhibitions, and events. You can also sign up for SEFAA's monthly E-newsletter to receive news and information directly in your inbox. Sorry, this workshop is sold out and registration is closed. Please email if you would like to be added to the waiting list.